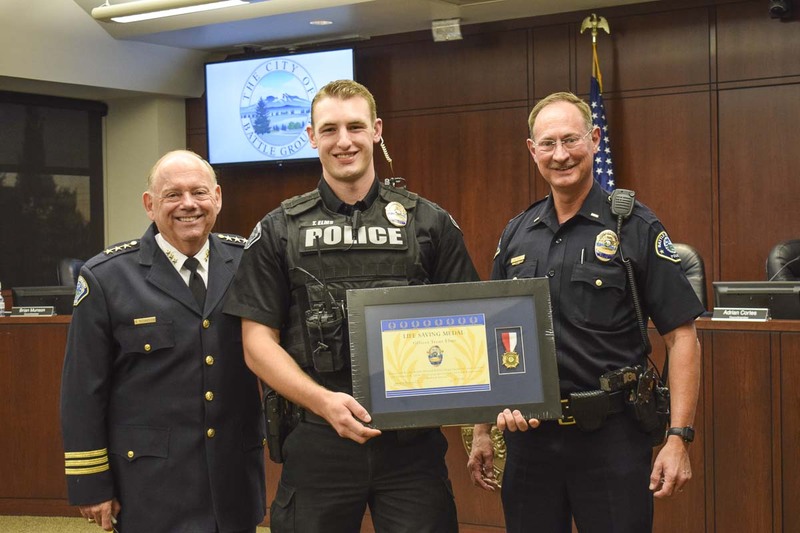 BATTLE GROUND — Officer Trent Elms was recently presented with the Battle Ground Police Department’s Life Saving Medal for his skilled observation and swift action that saved the life of a 26-year-old man. In February of this year, Officer Elms was dispatched to a medical assistance call with a request for an AED. Because police officers are often the first to arrive at a scene, all Battle Ground police vehicles are equipped with a defibrillator; officers also carry and are trained in the use of Naloxone – a lifesaving medication designed to block the opiate receptors in one’s nervous system. Officer Elms was the first to arrive at the scene where he observed a man, 26 years of age, on the floor of his home unconscious; his brother was applying chest compressions. The patient was purple in color and he did not appear to be breathing. Further evaluation by Officer Elms indicated he needed to administer Naloxone to the patient immediately – paramedic units were still in route. Within one minute of administering the medication, the young man’s skin began fading from blue to pink again, and within five minutes, he regained consciousness and was able to respond to questions. Battle Ground Police Officers were first equipped with and trained on the use of the Naloxone in October of 2017. The February 2018 call in which Officer Elms saved the man’s life, was the first deployment of the lifesaving medication within the Battle Ground Police Department.